IN-FLIGHT 200 Models: one limited edition collectable, die-cast metal airliner model in a 1/200th scale of a Boeing B777-39L/ER in the Air China Airlines Special Love China Color Scheme. Airframe Registration B-2001. This model is constructed of die-cast metal with some plastic parts. Model Stand is Included. This product is available beginning in September, 2016. IN-FLIGHT 200 Models: one limited edition collectable, die-cast metal airliner model in a 1/200th scale of a Boeing B777-39L/ER in the Air China Airlines Current Color Scheme. Airframe Registration B-2046. This model is constructed of die-cast metal with some plastic parts. Model Stand is Included. This product is available beginning in September, 2016. IN-FLIGHT200 Models: one limited edition collectable, die-cast airliner model in a 1/400th scale of Lockheed C-100-30 Hercules in the Air China Airlines Old Colors. Airframe Registrations B-302. This model is constructed of die-cast metal with some plastic parts. This product is available beginning in December, 2004. IN-FLIGHT200 Models: one limited edition collectable, die-cast airliner model in a 1/200th scale of a Boeing B747SP-44 in the Air Namibia Airlines Last Color Scheme. Airframe Registration ZS-SPC. This model is constructed of die-cast metal with some plastic parts. This product is available beginning in November, 2015. IN-FLIGHT200 Models: one limited edition collectable, die-cast airliner model in a 1/200th scale of a Boeing B747-475 in the Air New Zealand Airlines Current Colors. Airframe Registration ZK-SUH. This model is constructed of die-cast metal with some plastic parts. This product is available beginning in February, 2014. IN-FLIGHT200 Max Models: one limited edition collectable, die-cast airliner model in a 1/200th scale of a NEW Mold Airbus A350-900 in the Airbus Industries Roll-Out House Colors. Airframe Registration F-WXWB. This model is constructed of die-cast metal with some plastic parts. Both the flaps and slats are deployed, and comes with plug in magnetic landing gears. A display stand is included. This product is available beginning in January, 2015. 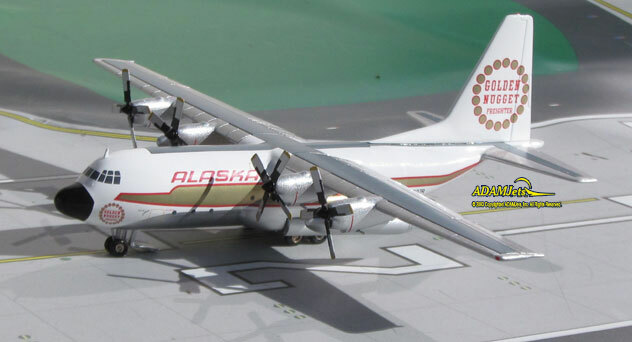 IN-FLIGHT200 Models: one limited edition collectable, die-cast airliner models in a 1/200th scale of a "NEW Mold" Lockheed L-382B Hercules in the Alaska Airlines Old Colors. With "Golden Nugget"�titles. Airframe Registrations N9227R. This model is constructed of die-cast metal with some plastic parts. This product is available beginning in December, 2014. 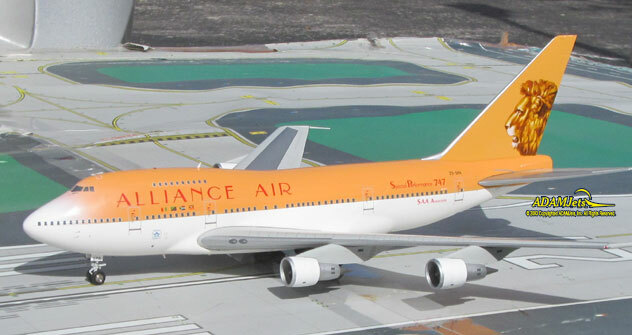 IN-FLIGHT200 Models: one limited edition collectable, die-cast airliner model in a 1/200th scale of a Boeing 747SP-44 in the Alliance Air Airlines Last Colors Scheme. Aircraft Registration ZS-SPA. This model is constructed of die-cast metal with some plastic parts. This product is available beginning in December, 2015. IN-FLIGHT 200 Models: one limited edition collectable, die-cast metal airliner model, in a 1/200th scale of a Boeing B720-023B in the American Airlines Old 1960s Lightning Bolt Colors Scheme. With Astrojet titles. Airframe Registration N7540A. This model is constructed of die-cast metal with some plastic parts. Model stand is included. This product is available beginning in August 2015. IN-FLIGHT200 Model: one limited edition collectable, die-cast airliner model in a 1/200th scale of a Boeing B787-8 Dreamliner in the American Airlines NEW Delivery Color Scheme.Airframe Registration N801AC. Model Stand is included. This model is constructed of die-cast metal with some plastic parts. This product is available beginning in March, 2016. INFT200/JFOX Models: one limited edition collectable, die-cast airliner model in a 1/200th scale of an Airbus A350-900 in the ANA - All Nippon Airways Delivery Scheme. With Bold titles 350. Aircraft Registration JA359A. This model is constructed of die-cast metal with some plastic parts. Both the flaps and slats are retracted, and comes with plug in magnetic landing gears. A display stand is included. This product is available beginning in October, 2015. IN-FLIGHT200 Models: one limited edition collectable, die-cast metal airliner model in a 1/400th scale of a Boeing B747-312 in the Ansett Australia Airlines Old 1990�s Colors Scheme. Airframe Registration VH-INK. This model is constructed of die-cast metal with some plastic parts. Model Stand is included. This product is available beginning in December, 2015. IN-FLIGHT200 Models: one limited edition collectable, die-cast metal airliner model in a 1/400th scale of a Boeing B747-412 in the Ansett Australia Airlines Old 1990�s Colors Scheme. Airframe Registration VH-ANB. This model is constructed of die-cast metal with some plastic parts. Model Stand is included. This product is available beginning in December, 2015. IN-FLIGHT 200 Models: one limited edition, collectible die cast airliner model in 1/200 scale of an McDonnell Douglas DC-10-30 in the AOM - French Airlines Old Colors. With Club France America Logo. Airframe Registration F-BTDE. The model is constructed of die-cast metal with some plastic parts. This product was released in November, 2010. IN-FLIGHT Model: one limited edition, collectible die cast airliner model in 1/200 scale. All construction is made of metal, with some plastic parts, of an McDonnell Douglas DC-10-30 in the ATA - American Trans Air in their Last Colors. Airframe Registration, N701TZ. This models is available as of November, 2008. 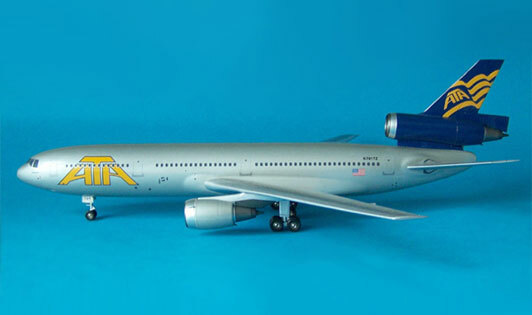 IN-FLIGHT Model: one limited edition, collectible die cast airliner model in 1/200 scale. All construction is made of metal, with some plastic parts, of an Boeing B727-230/Adv. in the British Airways (Comair SA) Old "USA" World Tails Colors. Airframe Registration, ZS-NVR. This models is available as of August, 2010. IN-FLIGHT Model: one limited edition, collectible die cast airliner model in 1/200 scale. All construction is made of metal, with some plastic parts, of an Boeing B727-230/Adv. in the British Airways (Comair SA) Old "Holland" World Tails Colors. Airframe Registration, ZS-NOV. This models is available as of August, 2010. 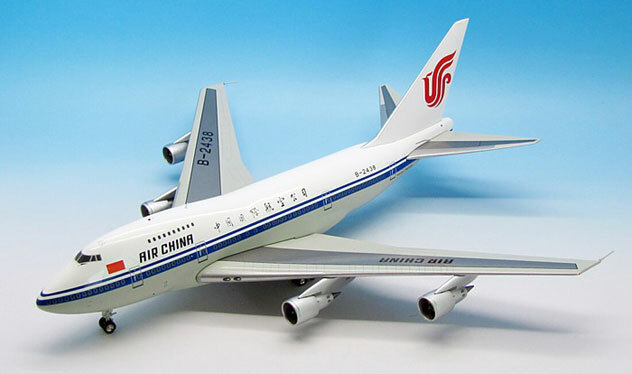 IN-FLIGHT Model: one limited edition, collectible die cast airliner model in 1/200 scale. All construction is made of metal, with some plastic parts, of an Boeing B727-230/Adv. in the British Airways (Comair SA) Old "Ireland" World Tails Colors. Airframe Registration, ZS-NZV. This models is available as of August, 2010. IN-FLIGHT Model: one limited edition, collectible die cast airliner model in 1/200 scale. All construction is made of metal, with some plastic parts, of an Boeing B727-230/Adv. in the British Airways (Comair SA) Old "Scotland" World Tails Colors. Airframe Registration, ZS-OBO. This models is available as of August, 2010. IN-FLIGHT200 Model: one limited edition, die-cast airliner model in a 1/200th scale of a Boeing B787-8 Dreamliner in the British Airways Current Union Flag Colors. Airframe Registration G-ZBJB. This model is constructed of die-cast metal with some plastic parts. This product is available beginning in October, 2013. IN-FLIGHT Model: one limited edition, collectible die cast airliner model in 1/200 scale. All construction is made of metal with some plastic parts, of an Embraer ERJ-145EU in the British Airways Old Botswana World tails Colors. Airframe Registration G-EMBD. This models is available as of May, 2010.